FRANKLIN, Ky. – Kentucky Racing Acquisition, LLC (“KRA”), a new company co-founded by Ron Winchell and Marc Falcone, announced today that it has entered into a definitive agreement to purchase all the assets of Kentucky Downs from parent company Kentucky Downs Partners, LLC, the investment group that has owned the race track since 2007. Located near the Kentucky and Tennessee border, just off Interstate 65 and approximately 45 miles from Nashville, Tenn., Kentucky Downs features more than 750 Historical Horse Racing (“HHR”) machines and conducts live turf racing each September, including the annual running of the Grade III Kentucky Turf Cup race, on North America’s only “European-style” race course. Kentucky Downs is a pioneer in modern Historic Horse Racing, the electronic form of pari-mutuel betting on horses gaining nationwide recognition as one of the great financial success stories in the sport’s history. Since the introduction of the HHR machines, betting on racing at the southern Kentucky facility has increased from $20 million in 2010 to nearly $800 million to date in 2018. The co-founders of KRA are well-known within the horse racing and casino gaming industries. Ron Winchell oversees his family’s Winchell Thoroughbreds, a prominent racing and breeding operation located in Lexington, KY that currently owns more than 120 horses including racing and breeding stock. Marc Falcone brings significant financial and gaming experience to Kentucky Downs, having previously served as Executive Vice President VP, Chief Financial Officer and Treasurer of Red Rock Resorts, Inc and Station Casinos from 2011 to 2017. His previous investment business background includes Goldman Sachs & Co., where he focused on restructuring transactions in the hospitality and gaming sectors; Deutsche Bank Securities Inc., where as managing director he was recognized as one of the gaming, lodging and leisure industry’s top analysts; and Bear, Stearns & Co. Inc. The Winchell name is immediately recognizable in racing circles from its nationwide success and association with two extraordinary horses – recent Horse of the Year Gun Runner and three-time leading sire Tapit. 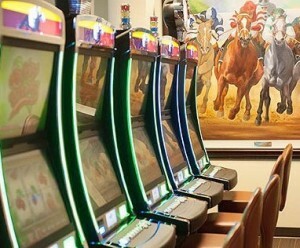 Winchell also operates more than 20 gaming locations across Nevada. His passion for racing is a tribute to his late father Verne’s commitment to and history in Kentucky horse racing and breeding. “KRA is committed to continually improve and enhance the business at Kentucky Downs by investing new capital in additional food, beverage and hospitality offerings as well as in technology and property infrastructure to grow the customer’s entertainment experience. KRA also is focused on the potential opportunity to develop a new facility in Oak Grove, KY if awarded that license by KHRC. An Oak Grove property under the umbrella of the new Kentucky Downs ownership would enable constructive marketing and operational synergies, optimizing market development and economic return to the Commonwealth of Kentucky and the many stakeholders in Kentucky racing, including owners, trainers, breeders and other professionals. With Kentucky Downs’ familiarity and understanding of the Nashville market, KRA would be strategically positioned to maximize that market for Kentucky,” Falcone added. The KRA transaction is expected to close early in Q1 2019, subject to regulatory approvals from Kentucky Horse Racing Commission (KHRC) and other customary closing conditions. Financial terms were not disclosed. 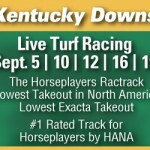 Kentucky Downs has lowered the takeout on its Pick 4 wager from 19 to 14 percent for its meet which begins September 1st, further reducing what already was the country’s lowest overall cost for placing bets. America’s most unique race meet runs Sept. 1, 6, 8, 9 and 13 over the country’s only European-style race course. Kentucky Downs offers among the world’s highest average-daily purses at $2 million a day for that five-date run as well as the highest average field sizes in North America,11 horses per race last year. The low takeout combined with big fields is what puts Kentucky Downs on top, Platt said. Takeout is the amount of each dollar wagered that comes off the top before winning bettors are paid. That money goes toward horsemen’s purses, the racetrack and parimutuel taxes. 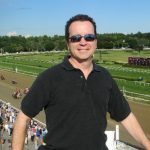 The Pick 4 is a 50-cent minimum wager where horseplayers seek to have in a single combination the winners of the four consecutive races comprising the bet. 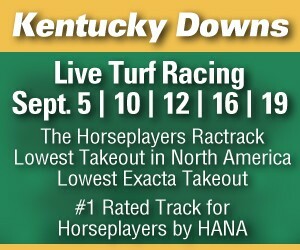 At 14 percent, the Kentucky Downs’ Pick 4 is among the lowest in the country. By comparison, most major tracks are at least 20 percent, some 24 percent or higher. Going from 19 to 14 percent reflects a 26-percent reduction in the cost of the bet. Kentucky Downs has been widely praised for lowering the cost of betting, while under state regulations the track could assess a takeout on multi-horse bets as high as 22 percent. Nineteen percent is the highest of any wager at Kentucky Downs. Kentucky Downs also has a 14-percent takeout on its Pick 5 wager, with its 18.25-percent rate on the popular exacta bet and 16-percent takeout on win, place and show wagering among the lowest in the country. The minimum wager is 50 cents for the trifecta, Pick 3, Pick 4, Pick 5 and Super Hi-5; $1 for exactas and daily double; $2 for win, place and show, and 10 cents for the superfecta.